The Washoe Theater in Anaconda, Montana was the last theater constructed in the United States in the Nuevo Deco (a form of Art Deco) style. 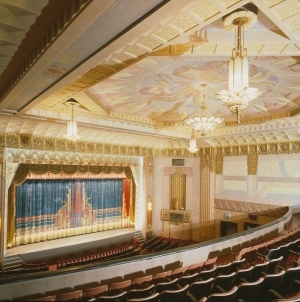 The theater was designed in 1930 by Seattle architect B. Marcus Priteca. It was almost entirely finished by 1931. The Smithsonian rates the Washoe as a national treasure due to the lavish interior. In 1982, the Washoe was listed on the United States National Register of Historic Places for architectural significance.